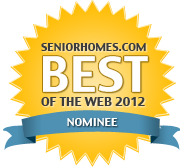 Click Here for more great savings! All Lift Chairs takes pride in supplying our customers with the best quality medical lift chairs available on the market today. But as we've stated elsewhere, it's our belief that these aren't just some of the most comfortable and luxurious lift recliners - Golden and Pride lift chairs are also excellent quality recliners even when compared to leading brands of standard recliners. Nearly every lift chair offered by Pride Mobility and Golden Technologies can be outfitted with heating and massage units. The massagers are designed to target the shoulders, lumbar, and seat regions of your body, and built-in timers let you budget out your enjoyment (lest you sleep the entire day away in your lift recliner!). The heat system is operated on a timer to minimize safety hazards. Heat and massage units can be installed in most Golden and Pride lift chairs for an additional cost ranging from $100-$225. We offer a wide selection of premium fabrics for the discerning lift chair shopper. You'll find lift chair fabric options in suede, velvet, UltraLeather, Brisa, and more. 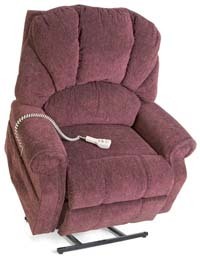 Pride Mobility also offers a custom leather lift chair which is upholstered in smooth, supple, 100% genuine leather. For more information about the luxury upholstery options available on our lift chair product lines, please visit our fabrics guide. If you're seeking a recliner for your home that offers maximum functionality, versatility, and style, look no further: here's an up-close look at six premium lift recliners available from All Lift Chairs that will perfectly complement your home decor and enhance your relaxation day after day! 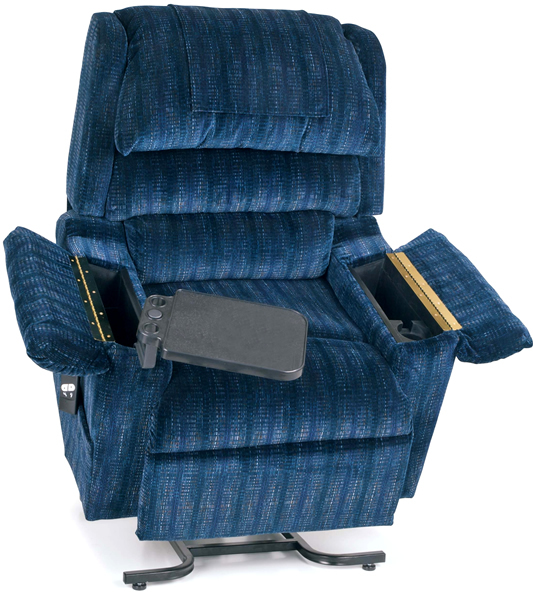 For all media enthusiasts, from sports aficionados with full digital satellite sports packages to web surfing mavericks and video game vanguards, Pride's LC-900 Media Lift Chair is the perfect indulgence for personal satisfaction, or a great gift idea for the guy who's already got everything. This beautiful three-position Pride lift chair is available in five different shades of premium Lexis vinyl - Black, Burgundy, Mushroom (tan), New Chestnut (brown), and Royal Blue. Not only do you get comfortable positioning and high-quality vinyl upholstery included in the base price, but you can also add the Pride Media Wedge, a portable personal armrest with built-in dual cup holders and a flip-open storage compartment. Adding the Pride Media Wedge to your home entertainment setup means never having to reach too far for a cold one during a critical moment in a basketball game, and always having every crucial controller, DVD or game disc you require directly at your fingertips. Get rid of that uncomfortable old desk chair that's been hurting your back and order an LC-900 Pride lift chair for maximum comfort while you watch, browse, or play! Add a lift chair table to your purchase for a sturdy work surface that's also great for having a snack during the action or double-checking your fantasy football stats during time outs! 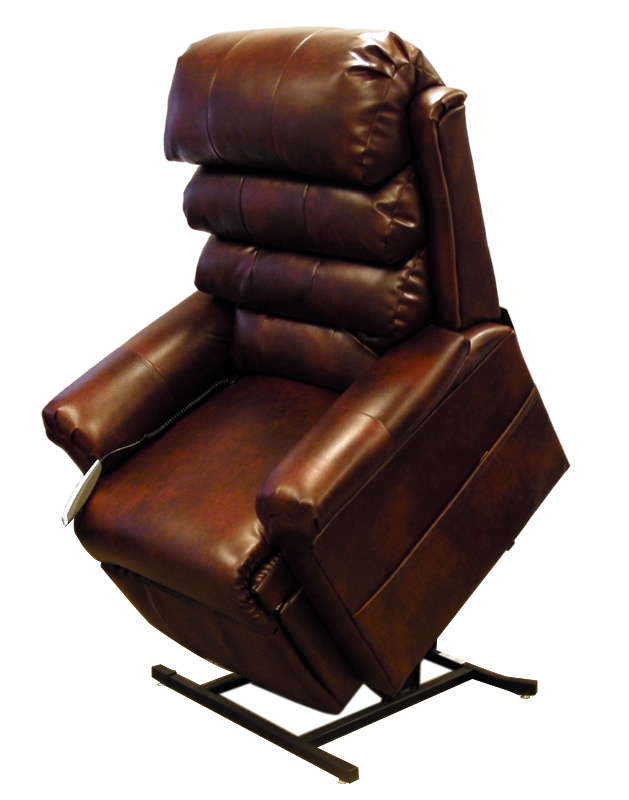 If genuine leather is a must-have for your home comfort needs, Custom Leather Lift Chairs by Pride Mobility are the way to go. Based on the very popular Pride LL-570 Elegance liftchair, these leather chairs feature thick, incredibly plush cascading pillow back cushions and full chaise padding on the seat. All seating surfaces, including the head and arm rests, are covered in genuine leather, available in your color choice of Oyster or Maroon. Other surfaces of this Pride lift chair are upholstered in matched shades of vinyl to complete the luxurious look of this recliner. 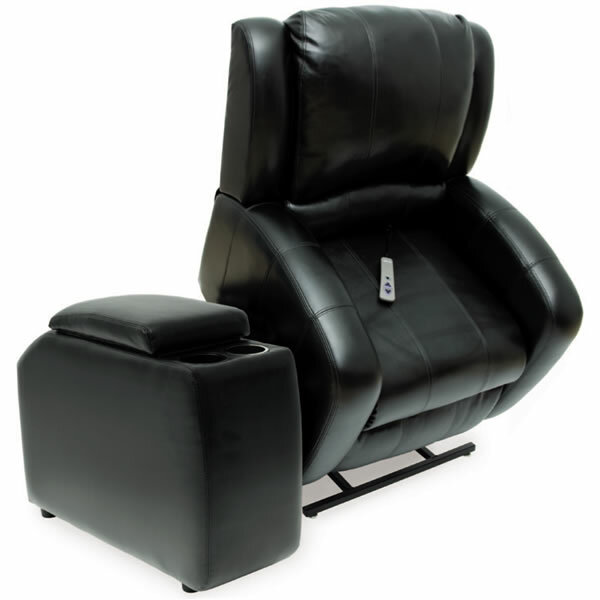 Enjoy full lift capabilities with the comfort of three-position reclining, and add a heat and massage unit for the ultimate luxury package for under $100.00! Of course, you can also add a lift chair table if you require a work surface or a convenient place for meals. The comfort of cool, smooth genuine hide leather can be yours for a fraction of the price our competitors offer! The LL-590 is the brawny darling of Pride's Elegance Collection - an ultra-wide (26") seat complemented by extra-thick shell-style cushioning and full chaise padding in the seat. This Pride lift chair is not only comfortable and roomy, but also strong - it can lift an impressive 375 pounds, making it more than adequate for the majority of our customers' lifting needs. While we do offer bariatric lift chair models with weight capacities of 500-600 pounds for those customers who require them, the LL-590 is a more affordable alternative that's just as comfortable. Choose from over 50 different fabric choices to create an optimal match for your decorative scheme, add heat and massage units for the ultimate relaxation experience, or choose head and lumbar pillows for added support while you doze away the hours! Model PR-571 is the official name for the Golden Regal, but we think the less formal name suits it best: This is a chair built for royalty. 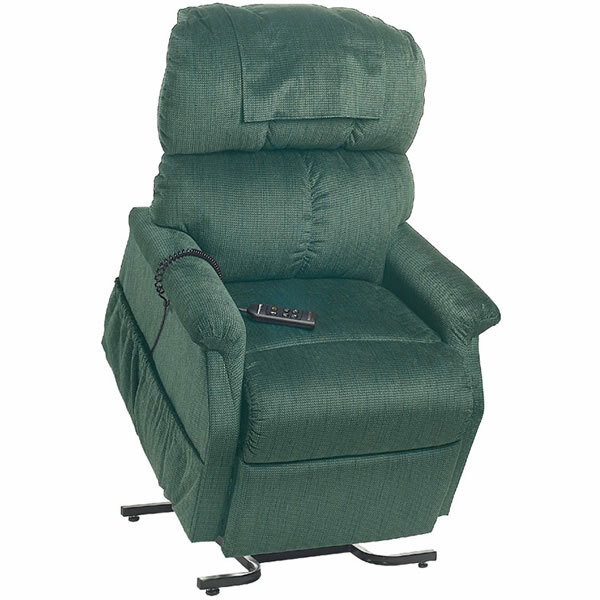 Cascading triple back cushions and three-position reclining form the core of this luxury Golden lift chair, and of course you can add a Tranquil-Ease heat and massage unit to optimize your recliner. What's even better about the Regal, though, is the part of it that you can't see: the hidden storage compartments encased in the arm rests beneath flip-open doors. If you spend a lot of time in your recliner, the Regal offers you plenty of space to tuck away books, magazines, remote controls, and emergency snack supplies. If you can keep a secret, so can the Regal - and you'll never have to worry about kids losing your remote control or pets getting into your chocolate stash! There's also a hideaway tray table in one of the armrests, so you have workspace without having to pay extra for a lift chair table! With all these available features, the Regal is truly one of the best-kept lift chair secrets in our catalog - a real diamond in the rough. The Pride Lift Chair Bed is based on the very popular LL-770L, a large infinite-position lift chair with a 22" seat and a very modern styling. A plush sewn-pillow back and chaise padding in the seat make this lift chair a dream come true for relaxing or napping, but what's even better about the chair is that its design perfectly complements the addition of a mattress. This Pride lift chair bed is best sized for a user of 5'5 to 6'0 in height and can support up to 375 pounds of weight, making it well suited to the vast majority of our customers. The welded steel frame offers long-lasting support and is designed to provide you years of service. With infinite-position recline and a full sleeper mattress, you're sure to find a configuration that's just right for you. 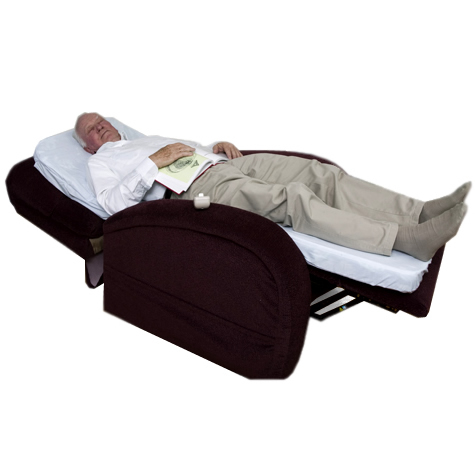 We highly recommend the LL-770 Pride Lift Chair Bed for users who plan on spending extended periods of time in their recliners; no other lift chair in our catalog will offer you as comfortable a sleeping surface for long naps on lazy days. A selection of over 50 fabric choices means you can choose an upholstery for your lift chair bed that best suits your lifestyle and home decor, including vinyl, velvet, suede, and UltraLeather. The MaxiComfort line of lift chairs by Golden Technologies boasts many positive attributes, but perhaps the best among them is the range of people these chairs can accommodate. MaxiComfort-line Golden lift chairs are available in three different sizes - Small, Medium, and Large - so you can choose the one that best fits you! These Golden lift chairs are sized to comfortably seat a user from anywhere between 5'0 and 6'2 in height. A selection of more than 30 fabric textures and colors, including vinyl, suede, and cool, breathable Brisa (which is perfect for warmer climates or sunporch use) means that you can easily customize this chair to match your existing furnishings and color scheme. 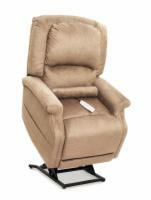 All MaxiComfort lift recliners utilize Golden's Zero Gravity infinite-positioning technology. Combine this limitless world of positioning possibilities with luxury chaise padding and a plush seam back cushion, and you'll soon realize why the MaxiComfort is so deserving of its name! You can also add a Tranquil-Ease heat and massage unit for the ultimate relaxation experience.